North American deer mouse from near Santa Fe, New Mexico, possibly Peromyscus sonoriensis. Copyright J. N. Stuart. The North American deer mouse Peromyscus maniculatus has been recognised as one of the most widespread mammal species in North America. It has been recorded from most of the continent, with the main areas of absence being northern Canada and Alaska, the south-eastern corner of the United States (where it is replaced by a closely related species, the smaller Oldfield deer mouse Peromyscus polionotus) and coastal regions of Mexico. They are highly adaptable animals, eating a wide range of foods, and their tendency to gnaw just about anything available for food or nesting has not always endeared them to their human compatriots. In recent years, they have also received their fair share of unwelcome attention as vectors for pathogens such as the Sin Nombre hantavirus*, which causes a devastating (and commonly fatal) pulmonary disease in humans. It is therefore not surprising that the deer mouse has become one of the most extensively studied mammal species out there (not quite in house mouse or black rat territory, maybe, but still definitely up there). A search for 'Peromyscus maniculatus' on Google Scholar brings back well over 16,000 results. Surely with this degree of attention, this is at least one taxon for which I cannot deploy my usual 'the taxonomy is uncertain'? *'Sin nombre' is, of course, Spanish for 'without name'. The reason for this coy appellation is that the virus in question was first labelled the 'Four Corners' virus after being identified from patients in that region of the United States in 1993, but was renamed after residents of the region protested. Of course it isn't. Quite the opposite, in fact. With a range this large, it is not surprising that a fair amount of variability has been recognised in the North American deer mouse over the years. Over sixty subspecies of Peromyscus maniculatus have been recognised from various regions. 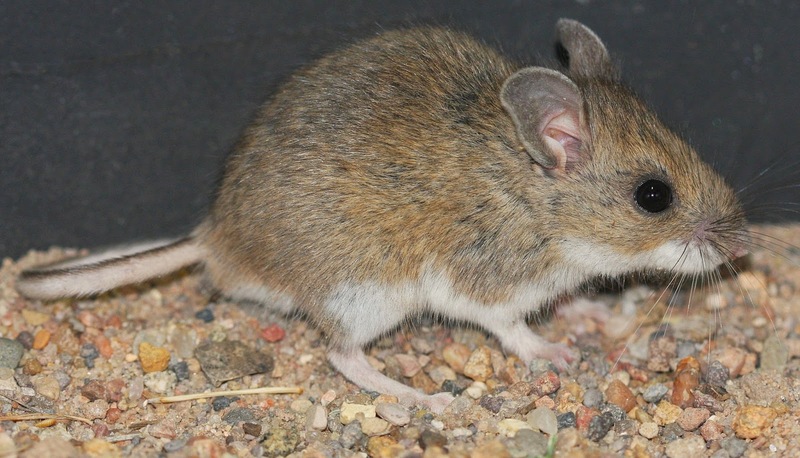 This variability has also been part of the deer mouse's appeal as a study animal, as evolutionary scientists have examined the relationships between subspecies. The problem comes when you realise that in some places you may find two distinct 'subspecies' of deer mouse in a single locality. If a 'subspecies' is defined as a geographical sub-unit of a reproductively coherent species (as it traditionally has been), then that ain't right. Two taxa occupying a single range and not interbreeding should be separate species, surely? But travel to another location nearby, and you'll find the two 'species' interbreeding and merging into one. One case that has been cited as a classic example of a 'ring species' is around the Rocky Mountains, where the subspecies P. maniculatus artemisiae and P. m. nebrascensis do not interbreed with each other, but both interbreed with other subspecies to the north and south. Part of the problem, of course, is that the 'species' is just a horrendously messy concept. There are a wealth of different species concepts out there, but the essential ideal underlying most is that a 'species' represents the point at which the reticulating relationships between interbreeding individuals become less important for understanding relationships than the branching relationships between population lineages. Which is not a point at all. Lineages diverge at multiple, quasi-independent levels in the process of speciation—they separate geographically, behaviourally, genetically, morphologically—and there is no magic point at which they suddenly change from 'one species' to 'separate species'. Nevertheless, as the recent trend has been to recognise species on a finer level than in the past, it seems likely that the future will see a subdivision of the current Peromyscus maniculatus. 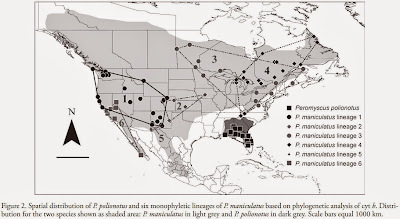 Figure showing distributions of lineages of Peromyscus maniculatus from Kalkvik et al. (2012). Over much of its range, Peromyscus maniculatus can be divided between two main morphotypes: a forest form with larger ears and a longer tail, and an open-country form with smaller ears and a shorter tail. Where the two forms are found in one region, they maintain their ecological distinctiveness. However, because of the aforementioned hybridisation between geographically adjacent populations, it is unlikely that any subdivision of P. maniculatus will be directly between these two morphotypes. One split that has already been widely accepted was proposed by Hogan et al. (1993), who found that certain populations in coastal north-west North America were genetically quite distinct from other P. maniculatus, and recommended the recognition of a separate species P. keeni. Peromyscus keeni is also generally larger and longer-tailed than P. maniculatus. However, more recent studies of the phylogeography of North American deer mice by Dragoo et al (2006) and Kalkvik et al. (2012) have found that even with the removal of P. keeni, P. maniculatus remains paraphyletic to both that species, to the south-west species P. polionotus (whose distinction from P. maniculatus has not generally been questioned), and possibly to the Mexican P. melanotis. Both the later studies identified six major lineages within P. maniculatus, and Dragoo et al. (2006) suggested that it may need to be divided between at least three species. The 'true' Peromyscus maniculatus, under this scheme, includes the two lineages found in the north-east of North America (the original type locality of the species being in Labrador). A coastal lineage found in the south-west was identified by both studies as related to P. keeni, and it remains to be seen whether it would be better included in that species or recognised as its own separate species. A lineage identified in southern New Mexico could be recognised under the name of Peromyscus blandus. The remaining two lineages, one found around the Rocky Mountains and one in the Great Plains, formed a clade that Kalkvik et al. (2012) identified as the sister lineage of P. polionotus. Dragoo et al. suggested that the name Peromyscus sonoriensis was available for this clade. However, Kalkvik et al. recognised that the Rocky Mountain lineage was a forest form and the Great Plains lineage a open-country form, so there may be grounds for their recognition as distinct species. While the correlation between these studies appears promising, it must be stressed that both were analysing the same gene (cytochrome b) and it remains to be seen whether the lineages they identified continue to be supported by other sources of data. It also needs to be seen whether they stand up to the inclusion of further populations: western Canada and Mexico stand out as poorly sampled areas in both studies. Peromyscus maniculatus in its current form may represent one species, it may represent four, or it may yet refer to even more than that. Dragoo, J. W., J. A. Lackey, K. E. Moore, E. P. Lessa, J. A. Cook & T. L. Yates. 2006. Phylogeography of the deer mouse (Peromyscus maniculatus) provides a predictive framework for research on hantaviruses. Journal of General Virology 87: 1997-2003. Hogan, K. M., M. C. Hedin, H. S. Koh, S. K. Davis & I. F. Greenbaum. 1993. Systematic and taxonomic implications of karyotypic, electrophoretic, and mitochondrial-DNA variation in Peromyscus from the Pacific Northwest. Journal of Mammalogy 74 (4): 819-831. Kalkvik, H. M., I. J. Stout, T. J. Doonan & C. L. Parkinson. 2012. Investigating niche and lineage diversification in widely distributed taxa: phylogeography and ecological niche modeling of the Peromyscus maniculatus species group. Ecography 35: 54-64. Excellent article, as usual. However, aren't the antlers useful in telling the species apart? Antlers can be misleading, as they may vary with age and health of the individual, or may be felt constructs held in place with a strap below the chin. 'Indified', of course, refers to something that has been subject to the process of indifying.